In the past the conditions of climate variability, ecosystem degradation and natural disasters imposed a deep insight in managing resources and the invention of cheap technologies and processes that were not destructive. In several climates and environments, incredibly tenacious cultures were able to use locally available materials and renewable resources. They used solar energy and the strength of nature. They applied the principles of wind, shadow and humidity to start interaction processes and amplify useful dynamics. Societies who promoted harmony with their environment flourished and created landscapes and ecosystems that make up the cultural heritage of humanity. The conservation of this heritage is possible thanks to the millenary complexity of knowledge and techniques commonly referred to as Traditional and Local Knowledge. Traditional Knowledge shows how to intervene in perfect agreement with the environment, highlighting its potential without exhausting it. It is fragile and subject to unwise transformations, nevertheless it is the means of subsistence for two thirds of humanity and constitutes an ingenious reserve of solutions and devices for producing energy, recycling resources and keeping microclimate under control. 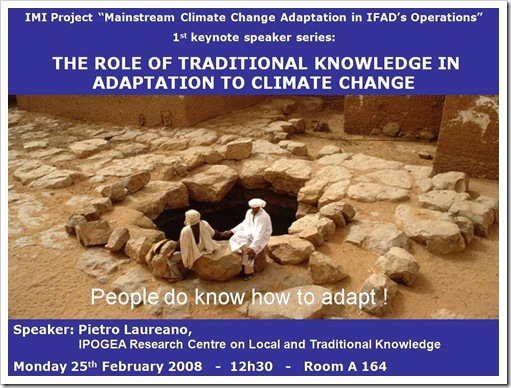 Using traditional Knowledge does not mean directly reapplying the techniques from the past but understanding the logical reasoning underlying the knowledge system and reapplying it in a creative way: today’s appropriate innovations constitute tomorrow’s traditional knowledge. Architect and town planner, is a Unesco consultant on arid areas and ecosystems in danger. He worked for eight years in the Sahara desert and coordinated projects in Algeria, Jordan, Yemen and Ethiopia. He is one of the 1,300 experts who took part to the Millennium Ecosystem Assessment (MA) launched by UN Secretary-General in 2001. In his quality as Italian representative in the technical scientific committee of the United Nations Convention to Combat Desertification (UNCCD) and as President of the Traditional Knowledge Panel promoted a world data bank on the local knowledge systems. At present this mission is being carried out by the research centre IPOGEA that was founded by the author and located in the Sassi of Matera. IPOGEA, Research Centre on Local and Traditional Knowledge, coordinates EU projects in 10 countries all over the Mediterranean and research and landscape restoration works carried out by means of traditional techniques and their innovative use.